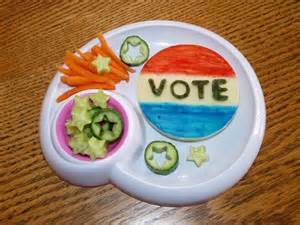 Food, Elections and Fear - Vegans Eat What? Vegans Eat What? Last night I went to an election party. (Ah, the election. …more on that later.) The hosts were meat-eaters, so that of course meant that I had to spend my afternoon making food that I could eat at the party. “How many times have I had to do this?” I asked myself as I packed up two huge bags of provisions and headed off to the festivities. Too many times to count. The party was lovely, and the crowd congenial, but I was certainly glad that I had brought lots of food. The main dish I had made (risotto) stayed in the kitchen. The hostess probably didn’t know what it was and was afraid to put it out for her guests. She did serve my appetizer though (sugar snap peas with a peanut dipping sauce), and I spent a good part of the evening standing by the food table munching on that. Not to my surprise, there was absolutely nothing else there I could eat. And, of course, I wasn’t surprised either that virtually no one at the party would taste the food I had brought. How many times has this happened? Too many to count. But the political theme of the evening got me to thinking. Promoting veganism is essentially a political process, and, as with any other political cause, it takes a long time. It’s often two steps forward and one step back. Sometimes its two or three steps back. People don’t like the unfamiliar. And while they may say they are for “change,” what they often really want is to change back to the old way of doing things. They say the two human motivators are desire and fear. It seems to me that with food and politics, and just about everything else in life, fear often wins out. People are afraid of music that wasn’t popular when they were teenagers. We’re afraid to try foods that our mothers didn’t serve us as children, and we’re terrified that someone might move in next door who doesn’t look or talk like us. We don’t want to give any of those things a chance. We would rather go back to a time—a time that never really existed—when we were young and protected and the world was familiar and predictable. The other night I heard a political commentator say that anyone who isn’t liberal when they are young is stupid, and anyone who isn’t conservative when they are older is equally stupid. Maybe that’s the way it is—every young generation has its hopes and dreams, but then those ideals are quashed by the fears of older generations. A few hours after I left the party I happened to be walking past a brand new, very upscale hotel that recently opened in my neighborhood. Just inside the door, there to greet guests, I was surprised to see a huge moose head hanging on the wall. What an odd thing, I thought, in such a new building. Who are they expecting? Teddy Roosevelt? The more things change, they say, the more they stay the same. I think that’s true. Unfortunately, lots of bad ideas stay the same, generation after generation, election after election, and yes, meal after meal. The more they stay the same, it seems to me, the harder we have to work to change them.